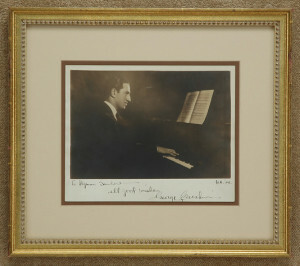 America’s most famous composer of the early twentieth century, George Gershwin, was very well known during his life time, and he wrote many letters, but they have been systematically collected by institutions, making the appearance on the market of letters concerning his music very rare. Musical quotations written out and signed by him are equally rare. At one time, a group of signed checks by the composer of “Rhapsody in Blue” were discovered and for several years these were available at reasonable prices.